During times of high fire danger conditions, the Office of the Fire Commissioner (OFC) asks all municipalities to please inform the OFC immediately at firecomm@gov.mb.ca when implementing or changing the status of municipal burning restrictions. 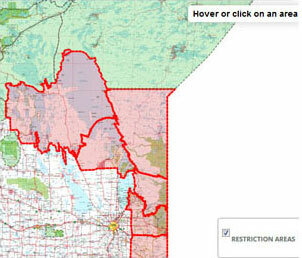 To learn about Burning Restrictions in effect, select a Rural Municipality (RM) from the dropdown list below or click on a selected area of the map. Questions about the Municipal Burning Restriction interactive map should be referred to the Office of the Fire Commissioner at firecomm@gov.mb.ca or call 204-945-3322 (toll free 1-800-282-8069). Questions concerning restrictions in a specific municipality should be directed to the municipal office. Rural Municipalities must have bylaws in place to enact burning restrictions for their areas. For more information on how to develop and implement restriction bylaws please contact the Office of the Fire Commissioner or visit www.firecomm.gov.mb.ca/support_bylaws.html . For more information on your municipality's burning permit and burning restriction bylaws, call the municipal office directly. Manitoba Sustainable Development does not implement or enforce municipal burning bylaws. Please refer to the local municipality or the Office of the Fire Commissioner for more information concerning municipal burning restrictions. During the wildfire season there may be times when high to extreme fire danger conditions require the Manitoba government to implement fire and travel restrictions within the province. 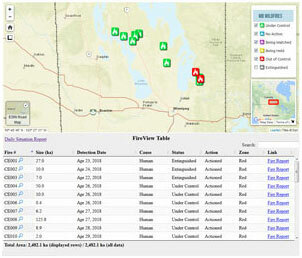 The FireView map illustrate the location and status of current wildfire activity in Manitoba.